The Israeli micro-satellite developer Effective Space Solutions last week announced the signing of a $100 million multi-year contract to provide satellite maintenance services to an unnamed client. Ahead of a two-day trip to Israel, Vice President Mike Pence visited neighboring Jordan and Egypt in an attempt to strengthen U.S. ties with the two Arab allies, and to reassure the countries’ leaders of America’s role as a peace broker between Israelis and Palestinians. A blueprint for coalition negotiations between Germany’s Christian Democratic Union Party, led by Chancellor Angela Merkel, and the country’s Social Democratic Party, headed by Martin Schulz, has stoked fears in Israel. The latest in a long series of extremist remarks by James Zogby, but this should be the proverbial straw that breaks the camel’s back. newsAs Iranian minorities join protests, should the US and Israel arm them? Could the U.S. and Israel more aggressively promote regime change in Iran through supporting dissident minority groups, including by arming them? Steven Spielberg’s latest film, “The Post,” has been banned in Lebanon due to the famed Jewish-American director’s purported ties with Israel. Ahead of International Holocaust Remembrance Day on Jan. 27, the World Jewish Congress (WJC) has launched a global campaign encouraging millions of people to use social media to raise awareness about the Holocaust. In “Anti-Judaism: The Western Tradition,” scholar David Nirenberg argues that on the one hand, Islam regards Jews as “enemies” of Muhammad’s prophecy, but on the other, Islam realizes only too well that without the existence of Jews and their practices, there would have been no subsequent prophetic tradition and faith to follow. Through its own words, the Iranian regime gives the lie to Western claims of “moderation.” The doctrine might also turn out to be the source of the Islamic Republic’s coming collapse, writes JNS columnist Ben Cohen. Abbas continued his rhetoric against Donald Trump at a conference focused on Jerusalem at Al-Azhar University in Cairo. President Donald Trump’s international negotiations representative, Jason Greenblatt, is arriving in Israel on Wednesday for meetings with representatives of the Middle East Quartet. President Donald Trump said he does not expect the U.S. Embassy in Israel to move from Tel Aviv to Jerusalem within a year, contradicting comments made by Israeli Prime Minister Benjamin Netanyahu on Wednesday. A Dec. 30 feature in The New York Times identifies Lebanon as perhaps the “one exception” in a region hostile to its LGBT citizens. The article completely ignores Israel, the only Mideast country where gay rights are legally protected. Some prominent Jewish proponents of the decades-long peace process between Israelis and Palestinians now claim that Palestinian Authority President Mahmoud Abbas’s controversial speech on Jan. 14 disqualifies him as a negotiating partner, while other dovish Jewish leaders are accusing the Trump administration of provoking the Palestinian leader. Leaders of several major American Jewish organizations told JNS they support the Israeli government’s decision to prevent the entry of foreign citizens who promote boycotts of Israel. The Trump administration’s approach to the Palestinians represents what Mideast experts and Israel advocates are describing as a paradigm shift in Washington—acknowledging that Palestinian rejectionism lies at the root of the Arab-Israeli conflict, rather than reflexively blaming the Jewish state for the impasse in negotiations. Among Israeli respondents, President Donald Trump’s approval rating is 67 percent. Honest cooking and sincere storytelling rely on similar ingredients: tradition, love, humor and spice, among others. These components are found throughout “Candies from Heaven,” the newly translated memoir of leading Israeli culinary journalist Gil Hovav. Prime Minister Benjamin Netanyahu’s visit to India is occurring against the backdrop of a massive and still growing river of defense sales and technology transfers from Jerusalem to New Delhi. Prime Minister Benjamin Netanyahu announced that Israel’s $500 million Spike missile deal with India is back on after the pact’s reported cancellation last November. Israeli Prime Minister Benjamin Netanyahu said his Indian counterpart, Prime Minister Narendra Modi, is “revolutionizing” ties between the nations as the two leaders signed nine bilateral agreements on Monday in New Delhi. A new report by the Christian charity group Open Doors has found that most of Israel’s neighbors, including Egypt, Jordan, Syria and the Palestinian territories, are among the world’s most dangerous places for Christians. Tunisian authorities arrested five suspects for last week’s firebombing of the historic Ghriba Synagogue on the island of Djerba. Israeli Prime Minister Benjamin Netanyahu (second from left) visits the iCreate Centre for Entrepreneurship and Technology with Indian Prime Minister Narendra Modi on Wednesday in the Gujarat province. Credit: Avi Ohayon/GPO. (January 18, 2018 / JNS) Prime Minister Benjamin Netanyahu announced that Israel’s $500 million Spike missile deal with India is back on after the pact’s reported cancellation last November. India’s 2014 deal to purchase the anti-tank missiles from Rafael Advanced Defense Systems had purportedly been overturned because the Indian Defence Research and Development Organisation planned to develop and produce its own anti-tank missile domestically. But Indian media reported last week that the deal—which would see India purchase 8,000 Spike missiles and 300 launchers—was back on, a development confirmed Wednesday by Netanyahu. 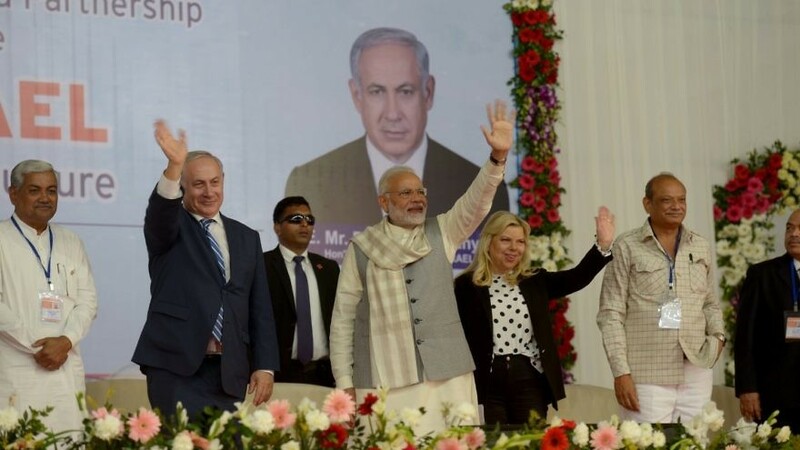 Also on Wednesday, Netanyahu toured Gujarat, the home province of Indian Prime Minister Narendra Modi. The two leaders were greeted by thousands of Indians who poured into the streets waving Israeli and Indians flags, while displaying signs bearing the faces of Netanyahu and Modi. Netanyahu said he was deeply moved by the outpouring of support for Israel by the Indian people. Netanyahu visited the province to attend an exhibition that showcased young Indian entrepreneurs and 36 Indian start-ups. “The world knows about iPod, they know about iPad, well there’s one more ‘I’ that the world needs to know about—iCreate,” Netanyahu said while visiting the iCreate Centre for Entrepreneurship and Technology. “We are working towards making entire system in our country innovation-friendly, so that ideas are formed from intent, innovations are formed from ideas and the new India is formed from innovations,” he added.